The Heart of Dixie has some of the deepest historical roots in America. From famous sites of the Civil Rights Movement, to World War II-era ships, to some of the oldest churches in the country, history buffs will enjoy everything Alabama has to offer. Here are the top 15 historical sites in the state. 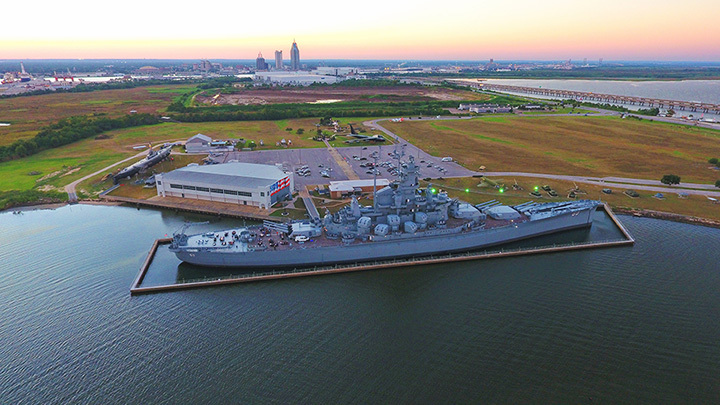 Commissioned in 1942, the USS Alabama served in World War II in the Pacific Theater. The ship is one of two remaining ships from this fleet after fighting in over 26 exchanges with the Japanese. Bethel Baptist Church served as the headquarters for the Alabama Christian Movement for Human Rights in the 1950s and 1960s. Their message focused on civil disobedience and nonviolent action through legal and direct acts, protesting segregation in schools, restaurants, and employment. Ivy Green is the birthplace of Helen Keller, a woman born deaf and blind who learned how to communicate through her teacher Anne Sullivan. Experience the fascinating and inspirational story by walking through the premises. One of the first and best known historically black colleges in the nation, the Tuskegee Historic site represents the work of Booker T. Washington and the many attendees who walked the halls. The school provided an industrial and agricultural curriculum for students to form their own local businesses. In the wake of humanitarian efforts by Dorthea Dix in the early 1800s, Bryce Mental Health facility became an example of what mental health reform should look like. Located on the University of Alabama’s campus, one can take a step back into the time of early medicine and learn what practices looked like. In the summer of 1963, new students Vivian Malone and James Hood became the first African American students to enroll in the University of Alabama. Governor George Wallace stood in front of the doors in protest in an effort to cling to segregation. The infamous “Schoolhouse Door” incident heightened the push for Civil Rights in the United States. This site stands as one of the lasting representations of Mississippian culture in the South. Settled sometime in the 10th century, the grounds represent the time before European settlement in the now United States and the people who lived there. Gaineswood is a look into the beautiful Greek architectural trend that existed in the antebellum South. The 19th century home sits on the grounds of endless trees and greenery, and stands out as one of Alabama’s best kept homes in this era. Named a national landmark in 1974, the church commemorates where Dr. Martin Luther King Jr. preached for several years. The site represents the fight for justice and equality in the country as one of the many homes of the Civil Rights Movement. This home is the birthplace of Alabama native Henry Clayton, a famous judge and legislature in the 19th century. Among many causes, Clay is most noted for his fight for anti-trust laws. Workers at Sloss Furnaces helped kick start the economy of the city of Birmingham, putting it on the map as an industrial hub in the nation. For 90 years, the furnaces produced mass amounts of iron. Today, you can visit the site for a look into the country’s strong industrial past. Kelly Ingram Park is yet another significant site in the series of Civil Rights landmarks Alabama holds. In early May of 1963, police retaliated against civil rights demonstrators, who had children among them, for protesting segregation. The incident helped to put the Civil Rights Movement at the forefront of the American cognizance. Enjoy true crime stories? Visit the Houston Jail. This site is the oldest jail cell in the state of Alabama and the second oldest in the country. You feel as if you are stepping back to the times of log cabins in the 1800s when you visit this site. The Stevenson Railroad Depot was a major junction at the height of the Civil War. Today, you can visit the depot to learn about the history of the Civil War and the role the invention of trains played in that century. Located in the heart of Mobile, the Richards House is one of the most stunning examples of Italianate architecture the state has to offer. Popular in the early 19th century among coastal cities, Italianate style homes took on a more intricate form of housing artistry from the Greek architectural revival common in the South. The Richards house truly demonstrates the pinnacle of beauty this style achieves with a marble gallery, Cornelius chandelier, and lace iron work. The house now serves as a museum commemorating the times and architecture styles of this century. View more Alabama Historical Sites.